What Is DD Form 1348-6? DD Form 1348-6, DoD Single Line Item Requisition System Document (Manual - Long Form) serves as the continuation sheet for the DD Form 1348 and is used in requisitioning a National Stock Number (NSN) and part number items, as well as other items for which the sufficient identifying data cannot be included on the DD 1348. The form - sometimes incorrectly referred to as the DA Form 1348-6 - was last revised by the Department of Defense (DoD) in February 1985. 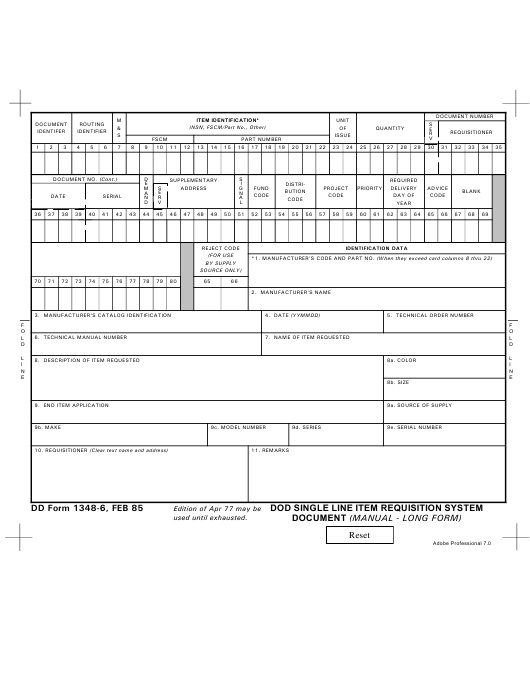 A fillable DD Form 1348-6 version is available for download and digital filing below or can be found on the Executive Services Directorate website. The DD 1348-6 is a multi-part document that can be prepared digitally, by typewriter, with a ballpoint pen or pencil. It is also possible to configure the documents in pads, sets, or single sheets according to the user's preferences. The form itself consists of two parts. The first part is intended for the MILSTRIP coding data, including a Reject Code section. If the supply source rejects the requisition, the corresponding code is entered in the Reject Code section and no other status documents are prepared. Enter the item Contractor and Government Entity (CAGE) code in Box 1 if available. After that, indicate the complete part number. Enter the manufacturer's name and address in Box 2 if the CAGE is not available. Specify the manufacturer's catalog identification number in Box 3. Indicate the date of publication in Box 4 in YYMMDD format. Boxes 5 and 6 require entering the applicable order and technical manual numbers respectively. This data is used to define the requested item. Box 7 should contain the appropriate name of the requested item. Box 8 is designed for the description of the item, including information about its color and size if applicable. Exhibits or photos of the item can also be attached. Box 9 requires details about the applicable end item for which the requested item applies: name, supply source, manufacturer's make, manufacturer's model and serial number, and the serial number of the end item. In case the application is unknown, enter unknown. Box 10 is reserved for the requisitioner's clear-text name, address (including ZIP code), and DSN or commercial number. Box 11 is for any additional data (including UII). The document can be completed in multiple copies, but only the original can be submitted as a requisition to the supply source. The used forms are mailed to the Logistic Control Activity to update the Logistics Intelligence File (LIF).